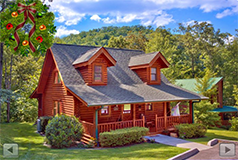 Cabins USA Top 10 Cabin Rentals Sevierville in the heart of the Great Smoky Mountains. Perfect cabins for your next vacation getaway. 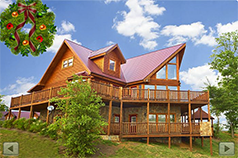 Oh, the views you will have from this luxury Pigeon Forge cabin! Large windows offer gorgeous mountain views and let in lots of natural light. A lovely deck provides access to your 6-person hot tub, a porch swing, and an incredible view of the Great Smoky Mountains. The home theatre system includes a 58” Plasma HDTV, Blu-Ray DVD player, surround sound, and a comfortable sectional sofa. For even more fun, there's also a sit-down arcade game with 60+ classic games to enjoy. 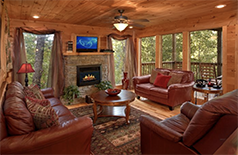 This 3-bedroom Pigeon Forge cabin rental offers spectacular Smoky Mountain views, Wi-Fi, a theater room, fireplace and game room. Situated high on a mountainside, this luxury 3 level cabin rental provides everything a family could need for a luxurious cabin stay. The living room's comfortable couches and television with cable and HBO allow the whole gang to enjoy a movie with the rolling hills of East Tennessee as a backdrop. With a great location that's only 5 miles from the Pigeon Forge Parkway, this cabin is ideal for guests who want to visit attractions like The Island, The Historic Old Mill, and Dollywood Theme Park. 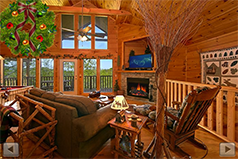 Better yet, this lovely resort cabin boasts a prime spot in the mountains, so you can enjoy a relaxing getaway surrounded by the beauty of the Smokies. After a great day spent exploring the scenic Smoky Mountains of Tennessee, you'll love unwinding in one of this cabin's 4 private bedrooms. Each bedroom is furnished with a king-size bed. Better yet, the upstairs master suite has a Jacuzzi tub and 3 other bathrooms offer bathtubs with jets. This is ideal for a family getaway or a group trip with friends. What a getaway! You will love this affordable and luxurious Pigeon Forge cabin with home theatre located in Rainbow Ridge Resort. 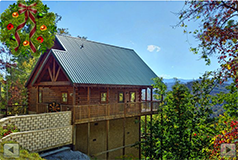 This unique lodge is the choice of many for family reunions, church retreats, and girlfriend getaways in the Smokies. WiFi, plush leather seating, a big screen TV, fireplace, and a baby grand piano are just some of the great amenities of Rocky Top Lodge. Enjoy spectacular views of the mountains from several seating areas and porch swing on the deck and host a cookout filled with the flavor of the great outdoors. Bring up to 24 guests to this premium luxury cabin in Black Bear Ridge Resort where you will find an invited living room area with stacked-stone fireplace, flat screen TV, and comfortable seating space. You’ll love the views from the floor-to-ceiling windows of this cabin’s beautiful forested area. A modern kitchen and dining room with two tables will accommodate everyone in your group. A game room and several flat screen TVs offer lots of entertainment. Private balconies with rocking chairs and a deck with a hot tub make this cabin complete. Honeymooners love this cozy cabin, and it is perfect for a couples getaway. 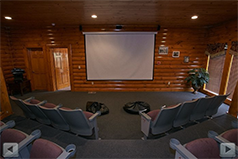 You will enjoy plenty of entertainment at the cabin — stream movies or games on the free wireless Internet, have an unforgettable movie experience with the 3D television or dance around with music from your very own jukebox in the living room. Enjoy some friendly competition and have some fun challenging each other on the custom designed pool table, and take a relaxing dip in the full size hot tub with Smoky Mountain views. During the winter months, cozy up in front of the fireplace. Enjoy the privacy of your own indoor pool while gazing out on a dusting of snow on those cold winter days. 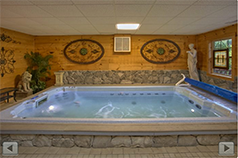 You can also play endless games of pool or enjoy a relaxing soak in the cabin's hot tub. 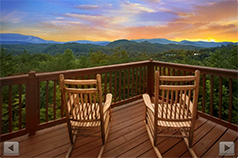 Enjoy beautiful Smoky Mountain sunsets from your cabin’s upper deck as you relax by the outdoor stone fireplace. 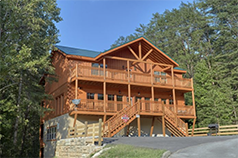 All of this, along with easy access to all the action in Pigeon Forge, makes Splish Splash Pigeon Forge cabin, an excellent choice for your next Smoky Mountain getaway. 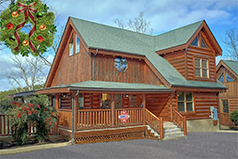 You are only minutes from Dollywood in this luxury log cabin with indoor pool. You will enjoy a large game room with air hockey table and pool table, a fireplace and sitting area, along with luxurious furnishings in this Sevierville cabin. Plan a cookout using the charcoal grill and the dining table made of 300 year-old teak wood. Beautiful mountain views will be enjoyed from the hot tub or rocking chairs on your cabin’s deck.